The Dropper Company has given the classic dropper a renewed image with a shapely, sensual design that is more eye-catching at point-of-sale. Thanks to its innovative design of a curved subtle shape for both the bulb and the cap, the cosmetic dropper benefits from a seductive look. The new dropper offering has been developed internally and manufactured at Virospack facilities. Novelty - Virospack's new dropper is differentiated through its design. Adaptability - The new dropper with curves has been developed to fit the standard 20/410 bottle neck. Increased standard offering - Virospack presents a new addition to its standard range of bulbs, with a curved appearance which distinguishes it from others in the line. 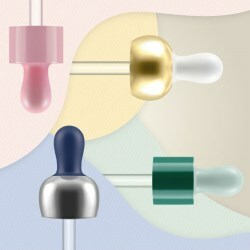 At the same time, the company presents two different standard curved caps that combine perfectly with the new bulb, meaning that, together, brands are able to choose between two new standard curved droppers. The curved bulb can also be combined with other existing caps in the Virospack catalogue. Customization - With a wide range of finishes available such as painting, metal shells, and metallization, customers benefit from a dropper dispenser pack completely personalised for their brand. Virospack's new offering increases its wide range of standards with a new line of curved bulbs and two curved caps that combine perfectly with the bulb. The company has acheived two new dropper models, boasting novel designs, as a result.